One of Jimmy Griffin’s passions was basketball. Ever since he was a little boy, he’d be seen dribbling, shooting, or playing basketball. 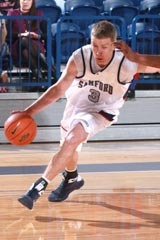 He played basketball at St. Bede, Marist High School, and achieved a Division 1 Athletic Scholarship for Basketball at Samford University in Birmingham, Alabama. Playing D-1 basketball was his lifelong ambition, and this Chicago Southside Irish Catholic boy proudly moved down South to fulfill his dream. His dream was cut short during his senior year on Tuesday, September 8, 2009, when he quietly passed away in his sleep at the age of 23. There were no symptoms, but his heart had an undetectable defect. His passing shocked and saddened all who knew him. But Jimmy Griffin was much, much more than basketball. He was a devoted son, brother, cousin, friend, teammate to so many people, who are simply devastated at his passing. There was standing room only at his memorial services both at Samford and at Marist High School. Over 3,500 people attended his visitation at St. Bede Church, and the church was filled to capacity at his funeral Mass. As you can see, he touched many people and left a lasting impact. The impact of a 23-year old young man was tremendous on those lucky enough to have known him, and those who didn’t know him well said they wished they did. “He always stood for what was right”, “a coach’s dream”, “he was the team’s leader”, “your son impacted my life as a coach”, “he was my role model”, “he embodied everything a coach would ever want, but more importantly everything a human should possess….integrity, loyalty, hard work, and perseverance,”, “he was the greatest teammate I was ever around.” “Losing him was my personal 9/11”. “My soul and heart are crushed at losing Jimmy” are all words written to the Griffin Family about Jimmy. As you can see by these words, Jimmy was somebody special. The Griffin Family is determined that Jimmy’s life and legacy will never be forgotten. Therefore, they have set up The Jimmy Griffin Legacy Foundation which has benefited and will continue to benefit places Jimmy so loved: St. Bede Church and School, Marist High School, Mother McAuley High School and Samford University. It will also benefit the American Heart Association. Over the last eight years the Foundation netted over $325,000, which was distributed in tuition scholarships, purchases and upgrades to the church and schools he attended. We are most proud of the scholarships we’ve awarded—just imagine the number of individuals Jimmy has helped in scholarships alone. The Tenth Annual 3 on Three Basketball Tournament and Skills Clinic will be held at Marist High School, 4200 West 115th Street, in honor of Jimmy on Saturday, March 30, 2019. There will be a Basketball Skills Clinic run by premier basketball players and area high school coaches for boys and girls in grades 1-4. The 3 on 3 Basketball Tournament will be for boys and girls starting in 5th grade to adulthood. There will be NO coed teams. Teams may consist of either 3 or 4 players (for an additional cost). There is a guarantee of two games; first and second place teams win prizes. Please click on our website at www.3onthreeforjg.org for information. Help us make this the huge success that Jimmy Griffin deserves. Be a part of it something so worthwhile; jump in. Help us “pay it forward” in Jimmy’s name.